Hillary & Obama: Who is the Real Tony Rezko Bud? 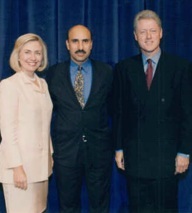 Ever since last week, when Hillary Rodham Cankles confronted Barack Hussein Obama head-on about his legal representation of “slumlord Rezko,” a photo has been bandied about featuring an early-Clinton Administration Hillary, Bill, and the infamous Antoin “Tony” Rezko, the Syrian-Arab businessman and federal indictee who was arrested for violating bond, this morning. But, while a picture is worth a thousand words, in this case, there is no relationship between the Clintons and Rezko. I checked campaign finance records, and Rezko never donated a dime to the Clintons. And while I despise Cankles and hope she never again returns as a White House occupant, the picture is not a smoking gun. 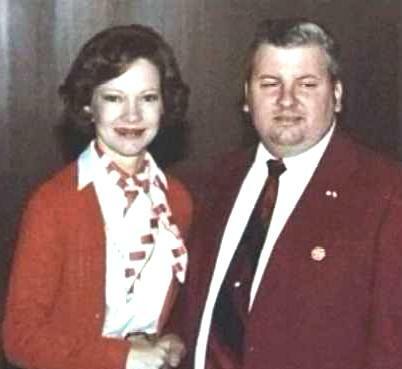 If it were, what about this White House photo, as supplied by Michael Zak of Grand Old Partisan, featuring Rosalynn Carter and serial killer John Wayne Gacy. As much as I hate the Carters, do you really believe she or Jimmy Carter had a connection to Gacy? The serial killers the Carters like are Palestinians and other assorted Muslims, not the American Infidel variety. Contrast all this and the photos with Obama’s close relationship with Tony Rezko. While he gave not a penny to the Clintons, he not only gave thousands to Barack Hussein Obama, but enabled Obama to buy a multi-million dollar home at hundreds of thousands of dollars below market price in a sleazy deal involving Rezko and Rezko’s wife. Further, there are allegations, in a piece I’ll be posting here in a few days, that Obama helped Rezko in his attempts to garner government-administered business contracts. Whatever the case, the fact is that Barack Obama and Tony Rezko were tight. And while Obama claims he gave Rezko’s contributions to charity, he only gave Rezko’s direct contributions to charity, not the over $100,000 in contributions that came from Rezko’s “associates” (and which Obama knows came from Rezko). And will Obama give his swanky Chicago house to charity, too? Only if he moves into 1600 Pennsylvania Avenue. But, without Obama’s sleazy arrangement with Rezko, he would be unable to afford the home or live in it. There is plenty of Clinton sleaze. But Tony Rezko is not part of it. He’s part of Obama sleaze. Seriously, Deb, does it make that much of a difference to which Demonrat sleezebag has recieved funds from which scumbag? To me, all progressives are indeed sleezebags except Alan Colmes, he’s just a useful idiot. The Clinton Crime Family should have known that this photo was out there. Had they published the photo themselves months ago, Hillary and Bill would now be in a much better position to slam Obama’s ties to his patron, Tony Rezko. It’s hard to take this writer seriously when he alleges that contributions in the vacinity of $100,000 – $200,000 (the latter figure includes Rezko’s lawyers, business associates, their families, etc.) “basically bankrolled Obama’s political career.” More nonsense. What was illegal about the real estate transaction? Nothing. His bid was the higher of two bids for the property. But if Debbie isn’t making up quotes(see a few posts above this) or pretending to know about topics in which she’s completely ignorant(see here takes on what a TE is below), she’s posting smears. Often smears that are dependent on the reader’s own ignorance and complacency.